Join Greg Albrecht as he examines what Jesus has to say about the kingdom of religion, through an eye-opening study of Jesus’ sermon in Matthew 23. Jesus uses words like woe, hypocrites, blind, greedy, self-indulgent, unclean, desolate, hell and snakes to describe the religious industry, its professionals and the consequences it brings into the lives of those it “serves.” But the kingdom of heaven, in stark contrast to the oppressive kingdom of religion, is a spiritual dimension of freedom and peace. 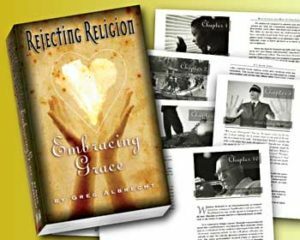 Rejecting Religion—Embracing Grace affirms the ultimate victory of God’s grace—even as the relentless waves of his grace will eventually erode and cover the shifting sands of religion like the waters cover the sea.